Castings should be thoroughly washed before painting. Mold release is used to prolong the life of the molds and will cause paint to adhere poorly. Use warm soapy water or a mild sink cleanser. Rinse in warm water and air dry. Do not apply heat to dry PARTS or use VERY hot water TO WASH. Urethane will soften and distort if heat is applied. Castings may need to have some flash, parting lines or sprue marks removed. A hobby knife and sandpaper works well. The urethane cuts and sands easily so use care. I prefer to wet sand. Use wet/dry sandpaper (320 through 600 grit) and keep the paper wet while sanding. Using water lessens the chance of scratching the castings and slows the cutting action of the sandpaper. Even though every effort is made to provide a perfect casting some filling of imperfections may be required. I’ll wash the castings and spray a light coat of automotive primer on before inspecting and cleanup. The gray primer makes any imperfection highly visible and also provides a base that body putty can adhere to. After filling, the putty can be sanded down using wet/dry sandpaper as described above. After the castings are finished to your liking they can be installed using slow setting cyano-acrylate adhesive or epoxy. Remember that cyano-acrylate type adhesives usually bond urethane resins INSTANTLY! Slow curing types will only give you a slight increase in time to position your parts. 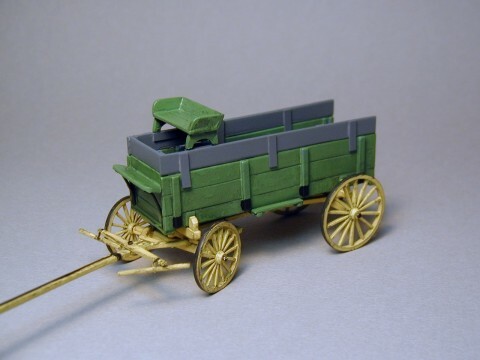 Converting your short wagon into a one or three box is very simple. 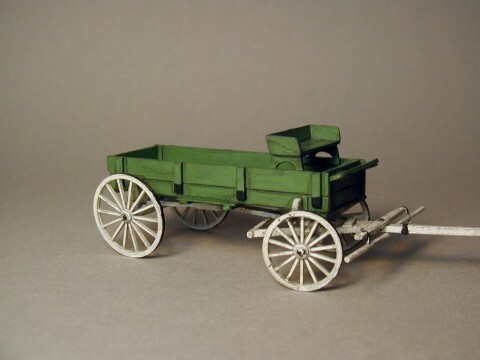 "Box" referred to the hauling portion of the wagon. If there were one set of side planks making up the box it was a "one box", two sets a "two box" and three sets a "three box". Often these planks were removable and a removable seat was hooked over the planks. 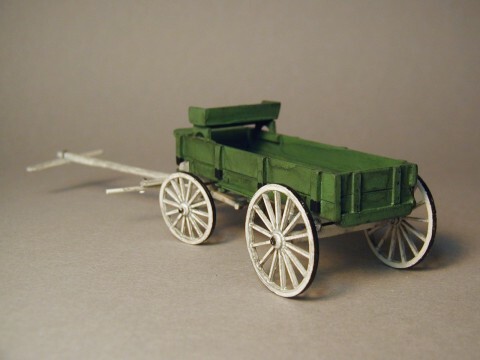 This allowed the wagon capacity to be increased or decreased as needed. Removing the top most board of the Left and Right Sides quickly changes it into a one box. Use an X-Acto knife to score the Side Wall castings between top and second side board. Score vertical posts at the same points. Score on inside and outside of walls and gently break away top board. Do the same for the Front and Rear panels. Clean up the edges with fine sandpaper. Cement a short strip of styrene inside each of the side walls. Size and location of the strip should be the same as the original ribs on the top board you removed. These ribs will form the mount for the Seat Supports. Finish assembling the box and install the seat per the instructions. 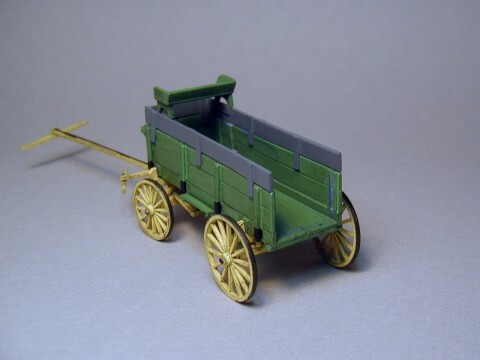 If you want to convert your wagon into a three box, fabricate additional boards from 0.040 thick styrene. Eight to ten scale inches in height is appropriate. Fabricate posts from 0.020 x 0.040 styrene strip. Don't forget to make a front plank. See the pictures below for some idea on how to space the posts. Add two strips horizontally inside the walls for the Seat Supports to rest on. In the case of a temporary three box arrangement it appears that the teamster simply rested his feet on the front plank as the foot board was not moved up.